It's amazing how much junk people can accumulate over time. Yet getting rid of our junk responsibly is sometimes easier said than done. Most people just end up taking everything to a landfill or throwing it in a dumpster, a quick and easy solution that doesn’t do any favors for Mother Nature. That’s why it's important to dispose of junk responsibly in order to live a more eco-friendly life and adhere to regulations associated with trash disposal. If you are feeling buried by a mountain of junk, consider following these tips for a junk-free life. 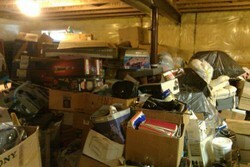 The first step to getting rid of your accumulation of junk is deciding what's actually junk and what's worth keeping. Many people keep items thinking they might prove useful down the road to themselves or their children, but these items can begin to stack up and leave you with little storage space. One rule of thumb says to eliminate seven items of junk from your home every day. Another option is to discard items that you haven't used in a year or more. Ideally, of course, you'll get rid of enough unwanted items so that you can live a clutter-free life and enjoy your space again. If the idea of holding a yard sale or selling online doesn't suit your time frame, consider donating your unwanted materials to resale shops or charitable institutions that may want them. You can donate items to Good Will, for example. If you aren't sure if the items you have are wanted by these organizations, you can call to find out what materials are accepted. You can't keep junk forever. You might as well reclaim your space and eliminate unwanted items from your home now. From professional junk hauling services to yard sales, you can not only get rid of your junk--you can get rid of it responsibly.